This entry was posted in Recovery & Support and tagged Drug Detox, Managing Symptoms, Overcoming Fear, Treatment on September 23, 2016 by Team Addiction Hope. Our nation faces an addiction epidemic. Fortunately, our understanding of the causes and consequences of addiction is improving, and there are more advanced and accessible treatment methods than ever before. Regardless of the avenue for recovery, the first hurdle for those with chemical addictions is detoxification: the process of the body ridding itself of the substance(s) to which it has become accustomed. Detoxification is a sensitive period where the body is flushing itself of harmful substances. The chemical change is often strong and creates a powerful reaction internally and mentally. Therefore, having experienced and professional care within arm’s reach is crucial. During this time, the withdrawal symptoms can be extremely painful and even lethal, depending on the substance. However, there are several options for easing the trauma of detoxification – beginning with nutrition. Learn even more about drug and alcohol detoxification here. 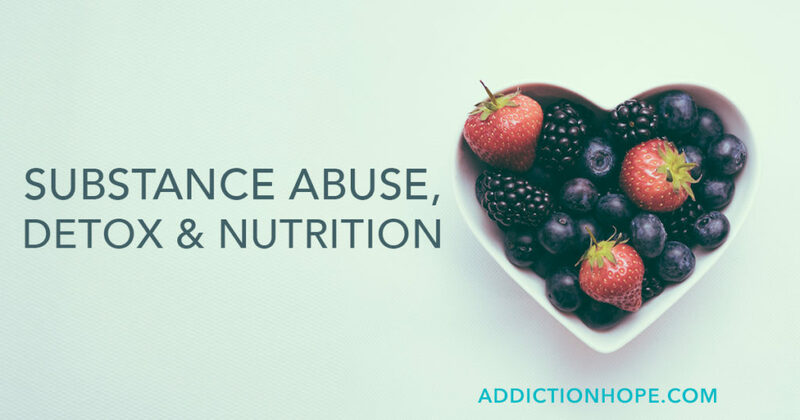 Often, those suffering from addiction haven’t taken proper care of their bodies, which means they’re likely deprived of proper nutrients that the body needs. This fact, along with the trauma of detoxification, means that those going through the process need to take special care of themselves. It all starts with what they choose to put into their bodies from this point forward. Generally, those in detox have little appetite. The choices that they make when they finally do eat are crucial, though. It takes a special balance of nutrition to heal and condition the body for a better future. Hydration: Your system will flush itself of toxins and chemicals, and in that process, lots of fluid will be lost. In addition, the symptoms of withdrawal can lead to vomiting and diarrhea, depending on the substance, which also results in dehydration. Anyone who has suffered a stomach virus understands this. Though it can be difficult, drinking sips of water will lead to a quicker recovery. Also keep in mind that dehydration can exacerbate the symptoms of withdrawal even further. Eat liquid foods, such as broth and soups: Detox takes a toll on your body and can cause significant nausea. This means it can also be hard for people to keep their food down. In the first few days of the process, a liquid diet is a wonderful idea because it meets caloric needs and should be more comfortable if any vomiting occurs. In addition, the body doesn’t have to work as hard during digestion. Supplement meals with vitamins: Those who abuse substances (particularly alcohol) tend to have several deficiencies of both vitamins and minerals. The chemicals in their bodies work to inhibit proper absorption and create these imbalances. In alcoholics, for example, B vitamins are most commonly affected. They’re necessary for making energy, which is a vital part of the healing process: The body needs energy for recovery. Vitamins A, D, E and K generally need to be added to a balanced diet, too. Cut back on sugars: Many people who are detoxing crave sweets: Their bodies are looking for quick energy, since they’re depleted of nutrients. However, these foods cause sugar spikes that can cause irregularities in the body’s metabolism. Fresh fruit provides nutrients and the sugar someone may need to recover. Additionally, it’s easily broken down by the body in the event of vomiting. Follow the food pyramid: It’s important that your diet be balanced during detox so it can heal effectively. Detox patients should eat a healthy number of fruits and vegetables every day. They also should cut back on dairy and proteins, but add some healthy oils –such as coconut oil or olive oil. For anyone recovering from substance abuse, giving the body what it needs to stay healthy will mean less craving for the addictive substance. This is doubly true during the detox phase. Proper nutrition, hydration and a positive attitude can make all the difference during the often-intimidating detoxification process.